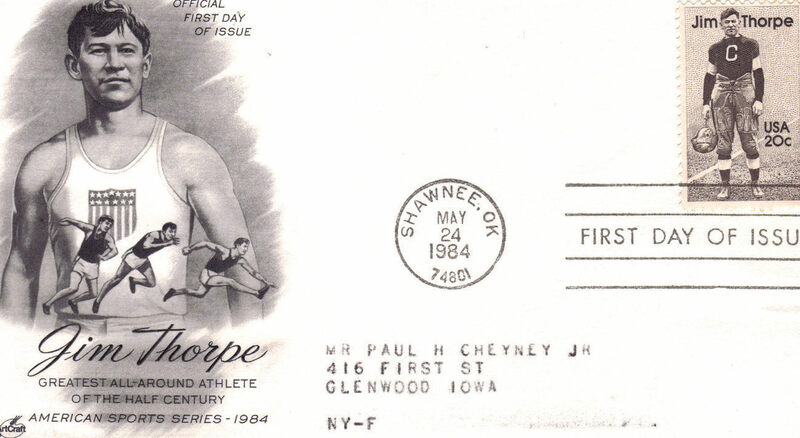 This is an exclusive limited edition commemorative cover produced by the Israel Stamp Collectors Society and the International Stamp Coin Collectors Society Celebrating the American Sports Series 1984 featuring the greatest all-around athlete of teh half century, JIM THORPE on this Official First Day of Issue. Stamped Shawnee, OK May 24, 1984. Measures 6-1/2" L x 3-5/8" H very minimal smudge at back of envelope otherwise in excellent condition. Send email if you need additional details. Buyer is responsible for 1.95 shipping to anywhere in the USA Canada. Send email for international rates. Do check the store for many more Las Vegas Collectibles daily. Thanks for stopping by!